For every woman the sweetest thing a man can do for her is the time he'll propose not just infront of her, but in front of the crowds around them. With Kim Jones case, it's more than that feeling. A man proposing in front of every body inside a church is more than ordinary, more than special, because a man did not only propose to her, he ask her directly to GOd, and that's more than special. 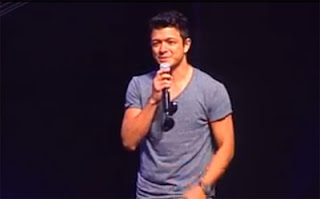 Jericho Rosales is an actor and born again christian and Kim Jones, is also a born again christian and TV host / model. In the video below, Jericho said, "God gave me the best person in the world, so will you marry me?,"
He asked Jone, then he walked closer to her and give the ring. For me, this is one of the best marriage proposal I've watched in my entire life. So let your hearts be inspired while watching Jericho's marriage proposal on church stage. The video was published on August 4, 2013, with a description saying, "Ptr. Joey Rafael preaches on, "Jesus is UNLI - Love: Can we count the ways?" and Jericho Rosales caps the message by sharing God's love for him and demonstrates this by expressing it with a marriage proposal. The congregation of New Life was so thrilled and blessed to witness Jericho Rosales propose to his girlfriend Kim Jones." Comments or suggestions about "Jericho Rosales marriage proposal video to Kim Jones | Watch here" is important to us, you may share it by using the comment box below.